A beautiful and healthy hair is the wish of every woman. It represents the beauty of both the shape and personality of each person. If you want a new look or attent everyone when you appear, let think about changing your hair. And virgin hair extension is a good ideal. 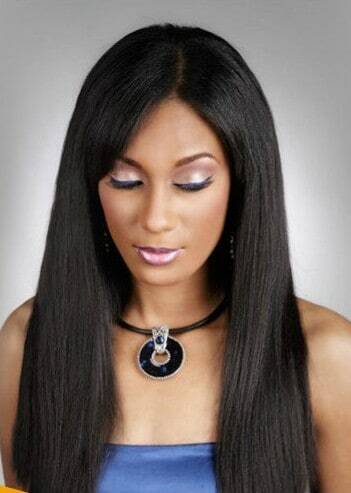 Virgin hair is smooth and strong hair, never affected by dyes, perms or harsh washes. The donors take care for their hair very carefully. They just use comb and coconut oil to brush and wash their hair so it grows very natural. Each virgin hair is purchased and pre-processed. Then it will be brought to the manufacturer to give the product is the best quality hair. What is virgin hair extension? You can come to Salon Hair to buy virgin hair extension. Here, the agents will provide you with specific product information as well as quality assurance. You will have the opportunity to use the product in the salon to choose the right virgin hair products. The Internet is another ideal. There are many online shops to supply you whenever and wherever. On their pages, they will provide you with the information about their goods such as source, size, color, price… You can complete the reference and give your best selection. However, you need to look carefully before ordering to avoid unwanted problems. To preserve the virgin hair extension, we need to leave it in a cool place, avoiding direct light from the sun. Besides, we need to use the appropriate hair treatment solution. Make sure your hair is smooth every day to keep your hair flowing smoothly and achieve the highest using results. The old saying:” Fine teeth and fine hair are most becoming”. Yes, the hair is always attached to the beauty of human beings. It helps us stand out better than everyone. A type of hair which is used by women in many countries is virgin hair. The virgin hair is understood to be a type of hair that has never been chemically treated, 100% human raw-hair, not been dyed, natural strong hair, soft, shine, not had lice or insect. Virgin hair which was collected and bought has been washed with fresh water and dried naturally by the wind. And after going through meticulous and careful stages, virgin hair extensions are given to customers. As it is real human hair, doesn’t use chemicals. It doesn’t harm to user’s health. The virgin hair becomes more famous when many famous artists such as Beyonce, Victoria Beckham, …used. They have made women, especially teenage girls, try to buy them. More other girls grow and sell their hair in order to earn money. In Vietnam, virgin hair is mainly exported to other countries. Vietnamese hair has cuticle intact from root to top. The largest virgin hair markets in the world are Russia, US, India, Brazil, China, … Vietnam’s virgin hair market is becoming one of the spotlights in the hair industry nowadays. How do we recognize virgin hair? Not hard at all! When the hair is burning, we will see white smoke soaring. This white smoke has a characteristic odor. This is the simplest way and there are other ways to recognize virgin hair. Experience and enjoy the wonderful feeling of using virgin hair products from us. Make yourself more confident and beautiful in people’s eyes. Your dear, why don’t you change your hairstyle once? Virgin hair is a perfect choice!